Listening to Neil Gaiman is such a lovely thing, I realized I would be willing to listen to him reading phone books or grocery lists. But it's even better to hear him reading his stories. 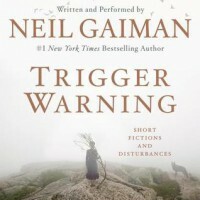 In his introduction, he discusses trigger warnings--from their start on the internet to their being attached to works of literature and art. He shares that after wondering if trigger warnings would ever be attached to his own work, he decided to be the first to do it. Proceed with caution if you are triggered by a wonderful, wide-ranging imagination.